From atop the poling platform at the stern of my boat, I had a good view of the waters around me. It was a clear day so spotting a snook or a redfish, two of the most popular backwater fish in south Florida, was simply a matter of looking in the right direction at the right time. “There, three o’clock,” I blurted out to my daughter. “Cast over there, now.” Emily responded with a deadly accurate cast and a few minutes later she was removing the hook from a five-pound redfish. And so it went – another day in angler’s paradise. From an angler’s perspective, Florida is one of the top destinations in the world. There are an abundance of salt water angling opportunities throughout the state from the panhandle and Jacksonville to Naples and Key West. 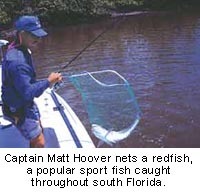 The best fishing is in south Florida – southward from Tampa on the west coast and Cape Canaveral on the east coast. Year-round warm weather and sunshine most every day results in few days that aren’t good fishing days. Catching redfish, snook, sea trout, tarpon, grouper, snapper, dolphin fish and an assortment of other species in the estuaries and nearshore waters isn’t a sure thing, but it’s darn close. Here’s a whirlwind tour of some of the top fishing destinations and what you can expect to catch. Only an hour and a half west of the mega theme parks in Orlando is Tampa Bay. The Bay is brackish water, a blend of salt and fresh water, and is brimming with fishing opportunities. Summertime brings the hot weather, near-daily thundershowers and a chance to hook up with a 100-pound plus tarpon. These amazing sportfish make an annual migration northward up the west coast each spring. 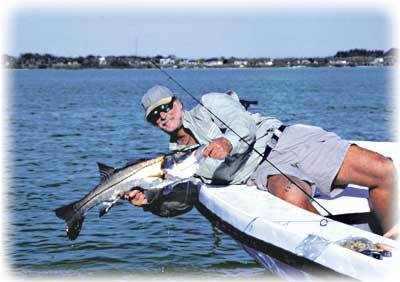 Hooking a silver king, a name given tarpon because of their silvery skin, is relatively easy. Getting the fish to the boat is another story. The first few minutes – sometimes longer – the fish puts on an aerial acrobatic show, frequently launching itself from the water and throwing its head violently from side to side in a attempt to break free. The tactic frequently works leaving the angler with some brief moments of pure heart-throbbing excitement. About a hundred miles south, near Ft. Myers is Boca Grande Pass, another famous tarpon hangout. The big fish, some in the 150-pound range, hangout in and around the pass in May waiting for some yet unknown internal signal to move offshore into the Gulf of Mexico where the fish spawn. The pass leads into Charlotte Harbor and Pine Island Sound, two areas with expansive shallow water flats many of which have seagrass growing on them. It’s the ideal spot to look for red drum (also known as redfish) and spotted seatrout. Both predators will readily strike at just about anything that comes their way. Year-round residents, the fish are fun to catch on light tackle. The fall is usually the best time for catching redfish and the winter is usually more productive for the trout. South of Ft. Myers, near Marco Island, the coastline turns and heads southeasterly. The shoreline changes from sandy beaches to a maze of mangrove islands, twisting waterways and small bays. Considered by many to be one of the top places to fish in Florida, the Ten Thousand Islands are remote, wild and a great place to wet a line. Snook, perhaps the ultimate salt water sportfish shares the limelight with redfish, spotted seatrout, pompano, and tarpon. Snook are caught year-round but the best season time of the year is May and June when the fish congregate in the passes and begin the spawning cycle. Snook of all sizes are caught, with trophy fish being those over 36 inches long. The fish’s reputation for being a great fighter and tasting great places it at the top of the list of fish to catch for many anglers. Redfish are another popular inhabitant of the Ten Thousand Islands. The peak season for this species is in the fall when schools of fish can move into the shallow waters, places anglers call the flats. This “skinny water” as the locals call it is usually less than one foot deep and it’s possible to see the wake the fish push in the water as they traverse the flat in search of a meal. Relying on your ability to see the fish, the idea is to cast your bait or lure in front of the fish and reel it back in so that the fish and the bait intersect. If successful and if the fish is hungry, you can watch the fish attack the bait. That extra second or two of anticipation provides a pure adrenalin boost to the ensuing battle to get the fish to the boat. The best way to experience the Ten Thousand Islands and guarantee catching fish is to hire a guide for a half or full day of fishing. Their price – ranging from around $250 for a half day to $400 for a full day for one or two anglers – includes the guide and boat plus tackle and bait. All you need to bring are your drinks and sandwiches. Besides the fishing, there is an abundance of wildlife to watch. There is an assortment of herons, egrets, ibis and other wading birds, osprey and pelicans observed overhead and along the shoreline. In the water, dolphin are a common site and there are frequent sightings of the endangered West Indian manatee. In contrast to the numerous bays along the Gulf of Mexico coast, the Atlantic coast is a ribbon of uninterrupted sandy beaches broken up by the occasional inlet that allows some exchange of water between the ocean and a series of lagoons, the largest and best known of these being the Indian River Lagoon. The lagoons are long narrow bodies of water separating the barrier island beaches from the mainland. Snook redfish, trout and a good number of tarpon and flounder are the primary catches. The snook tend not to be as large as the ones caught along the west coast but still put up a great fight when using light tackle. The reds and trout are a different story. Considerably larger than those caught on the other coast, the big “bull” reds – some in excess of 40 pounds – and the seven pound “gator” trout are the desire of many anglers. The lagoon system ends near Palm Beach but the fishing activity goes on and moves offshore. The great Gulf Stream, a current of ocean-blue water that flows northward, sweeps close to the shore sometimes coming to within a mile or two from the beaches. In the spring, sailfish begin their migration northward using the Gulf Stream as an ocean expressway. Typically, the Gulf Stream is ten or more miles offshore and requires a big sport fishing boat to access the rich fishing grounds. Around Palm Beach, anglers with boats of about 20 feet can fish for the famous ocean-going sport fish. These fish, typically less than 50 pounds, are famous for their aerial antics when hooked and for the great beauty of the fish with its greatly enlarged dorsal fin that looks vaguely like the sail from an ancient galleon. A touch of the tropics is what you find in the Florida Keys, a chain of small islands that stretch southwesterly from the southern tip of Florida. You can drive by car from Miami to Key West, the southern most city in the United States, via U.S. Highway 1. Along the way you have the Atlantic Ocean on your left and Florida Bay on your right. The narrow islands are the only land masses separating the two. 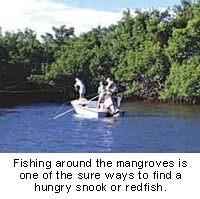 A typical day might begin in a skiff on the bay side fishing the flats for bonefish in the morning followed by a trip aboard a sport fishing boat for an afternoon trip into the Atlantic to fish for yellowtail snapper and dolphin. That’s dolphin fish, not the friendly mammal made famous in the American show Flipper. To keep the confusion to a minimum, dolphin fish is frequently referred to as Mahi Mahi. Dolphin fishing is unique. These fast growing fish live their entire lives in the open ocean waters. To find them, boats head offshore in search of wrack lines – lines of floating algae drifting about at the mercy of the wind and tides. Dolphin love to hang around anything that’s floating on the surface and these floating strands of algae are common offshore of the Keys throughout the summer. The fish tend to stay in schools in which all fish are of a similar size. Once you locate a school, catching your limit of fish is as easy as dropping a baited hook in the water. The strong-fighting fish ranks among the most exciting to catch. Just a few miles to the west, amid the calm shallow waters of Florida Bay, is one of the strongest fish, pound for pound, that you can encounter anywhere you fish. A seven pound bonefish can peel the line off a reel so quickly that an unprepared angler can be stripped of all the line on his or her reel in a matter of seconds. To make the chase more exciting, try stalking this fish using a fly rod. You haven’t fished Florida until you’ve battled a bonefish in the Keys. 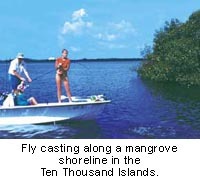 This is only a sampling of the salt water fishing opportunities in the sunshine state. 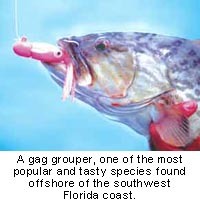 Bottom fishing for grouper and snapper in the Atlantic and the Gulf waters is a popular activity that has very tasty results. You can also search the Gulf water in the spring and fall for cobia or experience some of the best shark fishing offshore of the Ten Thousand Islands in the summer. There’s even a chance at a blue marlin offshore from the lower Florida Keys. Finding fish in Florida is easy. Catching them can be a challenge. Enjoying the experience – no matter the outcome – pure pleasure. Kris Thoemke’s book, Fishing Florida, is the most complete source of information about where and how to fish in the Sunshine State. He also offers the Ultimate Florida Fishing Adventure, a week of pure fishing some of the best destinations in south Florida. For more information contact him at kris@florida-outdoors.com.